I’ve been struggling with hormonal acne for at least 10 years and nothing was working. Sharmani recommended the A is for Anti-Aging Serum and in about a month, my breakouts significantly decreased. Beyond controlling breakouts, though I love the way my skin feels. It’s more smooth and also more even which is amazing! 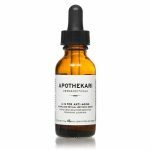 The fact that this serum contains retinaldehyde, which also helps to prevent skin damage and reverse existing damage is a definite plus.